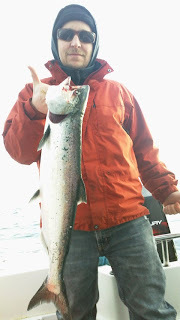 March fishing in Sooke presents a nice mix of tasty seafood options, with halibut, salmon, and Dungeness crab available for catching. With the halibut fishing season delayed a month to March 1st, there have been a lot of anxious anglers awaiting their chance to get out there and chase the big flatfish. The season opening last week has seen dozens of boats leaving Sooke Harbour in pursuit -- and plenty of halibut have returned to the docks, from Constance Bank off Victoria to Sombrio Point, and the many spots around Sooke. Dave Yakimovich of Ocean Dreams Charter Company reports some good fishing luck. He took out the Cougar Pacific Electrical crew last weekend, and guided them into three nice halibut, 55, 40 and 30 pounds. Yakimovich was a little cagey on giving up exactly where they caught these fish, saying only “west of Sooke”. However, he did report the halibut were caught using herring and salmon belly strips. Pictured is Simon with a 40-pounder and the rest of the crew with a 55-pounder. This weekend is the 1st Annual Sooke Halibut Derby and Festival. Organizer Paul Pudwell reports tickets are selling fast, so this event should prove to be a fun one for participants and spectators alike. The weigh-in is at the Crab Shack at 2pm Sunday. The winner gets a cool $5,000 cash, but all proceeds go to charity, including the winning halibut to be donated to the local food bank. Tickets are $50 at the Crab Shack or Eagle Eye Wilderness. Salmon fishing remains steady for winter Chinook. Here’s Peter with a nice hatchery Chinook “dinner fish”, caught off the Bluffs at 130 feet, on a red glow flasher and white glow hootchie. Squirts and hootchies are the “go to” lures this time of year for many anglers, in particular the purple haze and glow varieties. Other anglers have reported success with spoons and anchovies in teaser heads – these are a nice option in winter as the water is clear enough that you can fish them without a flasher, allowing a fun fight without the flasher’s drag. The salmon “slot limit” has been implemented early this year, meaning anglers can wild salmon from 45-67cm (approx 5-8 lbs) or hatchery-born salmon. This restriction is intended to protect the troubled early Fraser River Chinook salmon passing through Sooke waters over the next few months. Good luck to all anglers and make sure you play safe!